After hundreds of years of chaos, mankind has finally emerged from the ruins of a nuclear war. This world of the distant future has once again come to flourish under the guidance of the Great King, who has harnessed the power of the 8 Eyes to rebuild the planet. These strange jewels of power were formed at the centers of the eight nuclear explosions which nearly destroyed the Earth.Now, the Eyes have been seized by the Great King's eight Dukes in a desperate bid to gain control of the world. The King has been banished to the nuclear wastelands, and the world is ready to plunge into war. The task of retrieving the 8 Eyes falls to you: Orin the Falconer, the bravest and mightiest of the King's Guardsmen. 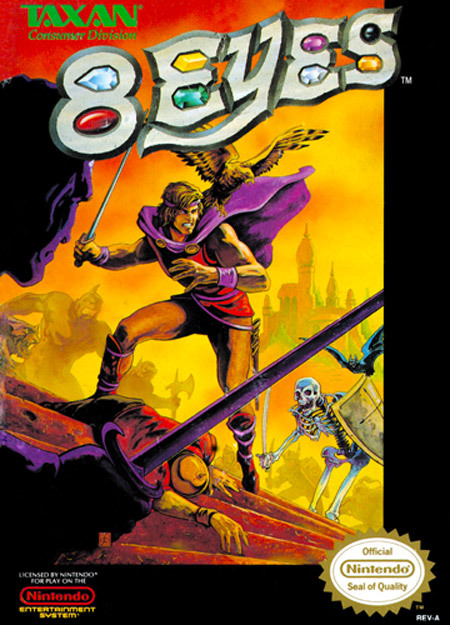 With your trusty falcon, Cutrus, you must infiltrate each of the eight castles and take down the Dukes one by one. You will face many soldiers, and do battle with strange nuclear mutants such as walking skeletons, giant wasps, and mud men. Return the 8 Eyes to the Altar of Peace and await the return of the Great King, so that he may finish the rebuilding of Earth. 2-Player mode allows the second player to control Cutrus the falcon. In 1-Player mode, things can be a bit trickier in that you must control both Orin and Cutrus in order to succeed.